It’s surprising what goes on in the seemingly sleepy world of the Charente in western France. 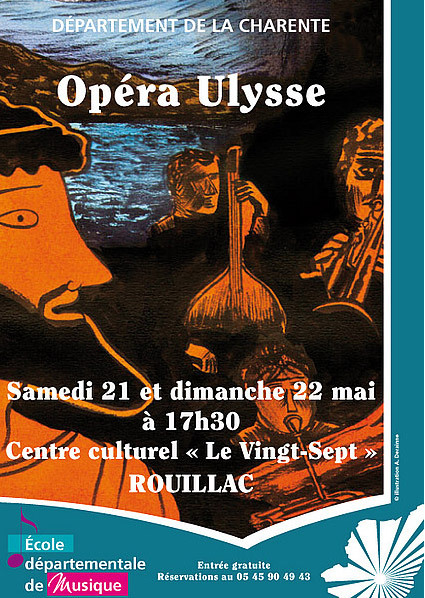 This weekend I took part in the Opera Ulysse. It involved pupils and their teachers from the Ecole de Musique, children drawn from many schools in the area and our own community choir Chantvallon, based in northern Charente. It all took place in “le Vingt-Sept” theatre in Rouillac, which if you’re unfamiliar with the town, is named after the renowned monthly market which takes place on the 27th of each month. The theatre is remarkable – not only because Rouillac is in fact quite a modest town to have such a place, but also because the facilities offered here would rival some of the regional theatres in Britain. The auditorium comfortably housed a full orchestra and an audience of around 700 proud parents and family friends. Two choirs remained on-stage throughout as the actors, soloists from the Conservatoire in Merignac and their supporting cast gave two wonderful performances of the 90 minute opera composed in 2010 by Laurent Jacquier. Considering some of the musicians were as young as 12 years old, the standard of musicianship and discipline they demonstrated was really impressive. Thinking back to my school days (I admit to being one who should have perservered), nothing like this would ever have been possible and I found myself marvelling again at the French willingness and enthusiasm to try something on a big scale and to make it such a success. 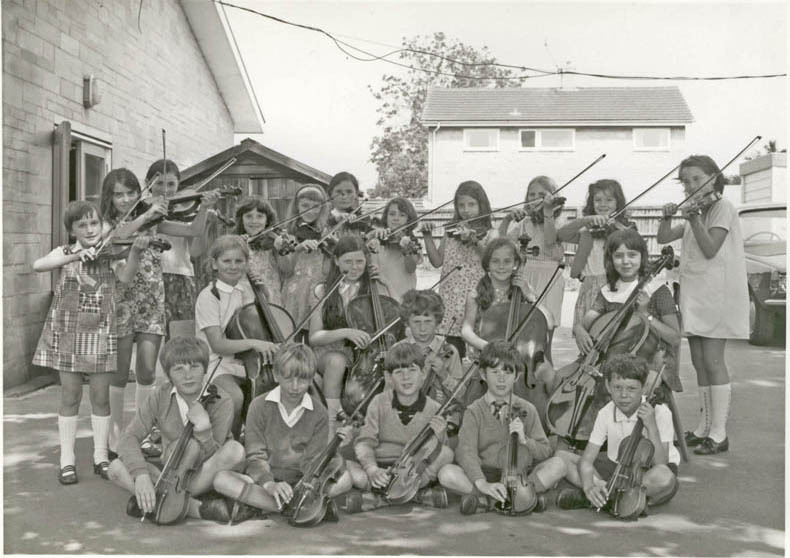 Part of my school orchestra circa 1970, St Mary's C of E School, Thornbury. I'm second from the left playing the cello. To the rear of our house is an enclosed area, bound on two sides by our house and a barn, the third by the remains of an old farmworkers cottage and the fourth by a wall bounding the lane. The whole area has always been a problem and I clearly remember Rog commenting on the potential disasters and drain on resources that it could entail while we were viewing the property. However, I had visions of a sunny enclosed courtyard with parking, summer kitchen and potager, a place to sit and enjoy the evening sun and hide ourselves away from the world. We bought the house. The first catastrophe happened even before we’d exchanged final contracts. The gale that swept across western France during the winter of 1999 / 2000 took the barn roof with it. The notaire informed us that not only were we buying less property than we thought but the owners were uninsured. He deducted the cost of repairs from the money we handed over for the house. The builder in our absence, chose to skimp on the job creaming off as much profit as he could. A taste of how shabby some people can be. The second thing wasn’t as catastrophic but the end wall of the barn had collapsed and we instructed another English builder to rebuild it leaving an entrance large enough for cars to get through as we had it in mind to make the barn into a garage. His workmanship was good but the gap too narrow. The old cottages had long since collapsed since the previous owners robbed the roof timbers and tiles to restore the main house. Trees were growing through the rubble and it was too dangerous to go inside. It had to go so we hired a couple of guys with a digger and a lorry to clear it and take away the rubble. After a week we had to call a halt, the cost was spiralling and although the area had largely been cleared, there was still one section to do and the back wall was really too high to be left unsupported. Then last autumn it rained. It rained hard and unusually long and everything was completely sodden. When the rain finally stopped, the skies cleared and the temperatures fell. We had hard frosts, and like everyone else in northern Europe we had snow. The snow stayed on the ground for a couple of weeks, freezing hard at night and leaving an inpenetrable layer of ice underneath. The stone walls around our rear courtyard are typical Charentais constructions of stone and earth. Built with great skill, they generally last for hundreds of years. But some of the stone is vulnerable. Through minute cracks or a slightly different composition they weather and split allowing the wet to get into the core of the wall. The earth becomes unstable and the whole lot slides to the ground. The first collapse was on the boundary wall. Our neighbour came to the door one afternoon and led me into the lane to inspect the damage. The second collapse was more serious as a chunk of the high back wall crashed into our neighbours garden, suffocating a flower bed. We had no choice but to employ a mason to rebuild the wall and remove 1.5metres off the height. We could only afford to do the affected section so this summer we’ll have to continue and finish the rest. The mason warned us that it could go at any time. We believe him! Meanwhile, the dream courtyard is still a long way off. We have plenty of manual labour ahead of us to stabilise the boundaries and tons of stone to remove. You’re never bored when you own a property like ours….never rich either! Author Julia MossPosted on Thursday, March 31, 2011 Tuesday, June 7, 2011 Categories architecture, Balandière, Charentais, France, gardenTags Barn, France, gales, limestoneLeave a comment on Anybody want some stone?